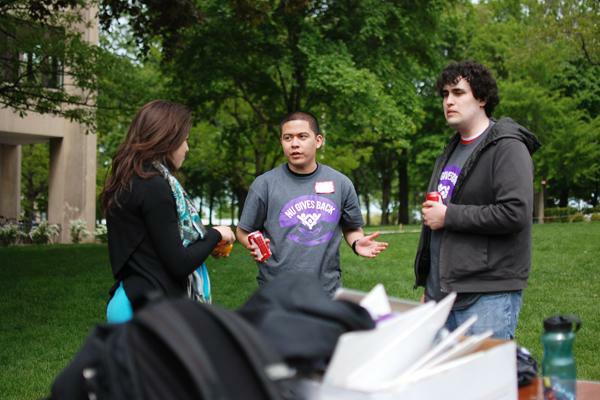 SESP junior Rebecca Rego (left), a co-president of NU Gives Back, talks Saturday afternoon with two participants, Weinberg junior Giovanni Delgado (center) and Weinberg sophomore Federico Paredes (right) about their morning of volunteering. Around 500 undergraduate and graduate students, alumni, and staff participated in the day of service this year. Northwestern students, faculty and alumni gathered Saturday morning to give back to Evanston and its surrounding communities. About 450 people came together to participate in the third annual NU Gives Back day of service, an increase of more than 100 over last year’s turnout, event co-president David Chase said. Volunteers went to about 30 different sites in the Chicago area, ranging from outreach centers for the homeless to programming for children with disabilities. Chase and fellow co-president Rebecca Rego, a SESP junior, said NU Gives Back is one of the most important days of the year to them, and they are excited about its growing success. The day kicked off with a talk by Merri Ex, president and CEO of Family Focus, who talked about her experiences volunteering and working at nonprofit organizations. Ex has headed Family Focus, a group dedicated to family support services, for two years. She thanked students for coming to the event and discussed the importance of community service. Some of the most popular sites this year included the Special Olympics, with about 120 volunteers, and the Northwestern Community Development Corps Carnival, with about 60. A few changes have been made since last year’s event, including the integration of peer advisers into the day of service and the addition of new site locations. Because another student day of service, Serving Communities and Promoting Engagement, was discontinued this academic year, Chase said NU Gives Back has become one of the biggest draws for helping out on campus. Before the volunteering began, Bienen freshman Alexandra Nelson said she got involved with NU Gives Back because of the PA requirement, but she was looking forward to the opportunity. Weinberg sophomore Donald Childs participated in the day of service for his second year. “Just making an impact on the community is important to me,” Childs said. After the event, participants were invited to join other volunteers on Deering Meadow for a debriefing session and celebration to reward them for their efforts and good work throughout the day.